Our amazing new private property option at Eumundi in Noosa’s hinterland is about to launch. If you are looking for a unique opportunity to experience nature at her very best ..while still enjoying the comforts of luxury tents and an up-to-date media centre, then this will be the perfect place to come and find fresh inspiration for your companies purpose and direction. This space caters for medium size corporate and lifestyle groups looking to immerse themselves in nature, while experiencing excellent dining, conference and bathroom facilities. Nestled into the rainforest wonderland of Noosa’s Golden Triangle, it is only a 20 minute drive from Noosa’s Hasting Street, 5 minutes to the popular Eumundi Markets and a 1.5 hr drive from Brisbane. Our amazing private chef Andy Wood delivers food for all dietary requirements onsite and you could even experience the best meal of your life under the stars like many of our guests who frequent our Pitch Luxury Camping experiences. This will become the place to “Glamp” when visiting Noosa. The land owners originally bought this property in 2002 with very little on it as it was ex-dairy cattle land. They went to work replanting it in the hope of bringing it back to its original glory and are now ready to share it with the public. They have truly done an amazing job! Fifteen years on, the wildlife is back. The wallabies, hares, an abundance of bird life, cat fish, goannas, and even a platypus in the creek. There are now trails around the property where the wallabies roam and many bird nests can be spotted in the trees. Beds of natural grasses surround the creek and are expanding out into the forest where the perfect private camping spots can be found. Only five minutes from Noosa beaches but feels like another world away. 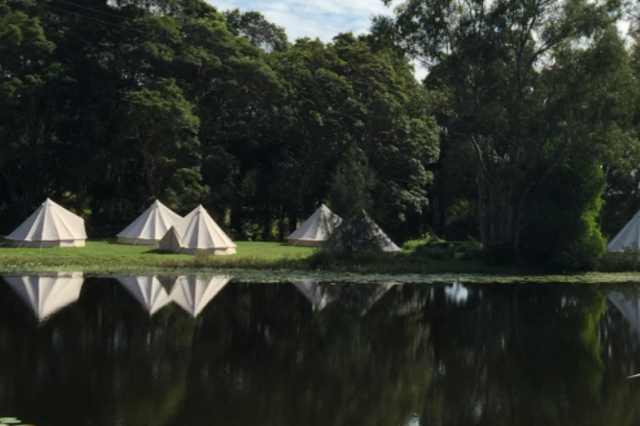 Ask about our new glamping health retreat venue in Noosa’s hinterland. All alongside our outstanding luxury camping experience.